These beautifully banded geckos from north- eastern Queensland have a fragmented distribution that is strongly tied to rock habitats. They are amongst Australia’s largest geckos and were once thought to be part of a widespread species, Cyrtodactylus louisiadensis, that also occurred in New Guinea and the Solomon Islands. In recent times, the Australian populations have been recognised as distinct from foreign Cyrtodactylus and the widespread C. louisiadensis has been restricted to a single island in southern New Guinea. The Cooktown Ring-tailed Gecko (Cyrtodactylus tuberculatus). Photo by Patrick Couper, Queensland Museum. Australian Cyrtodactylus have become a major focus for research by Queensland Museum Biodiversity Scientists and this work has been undertaken in collaboration with Glenn Shea from the University of Sydney. An initial analysis of tissues provided by staff from the Queensland Parks and Wildlife Service was conducted by the museum geneticist, Jessica Worthington Wilmer, and showed significant genetic structuring between Australian Cyrtodactylus populations. This paved the way for a more detailed look at this group. Queensland Museum Herpetologists, Patrick Couper and Andrew Amey undertook extensive fieldwork in north-eastern Queensland to obtain additional genetic samples and to fill gaps in the museum’s existing collections. 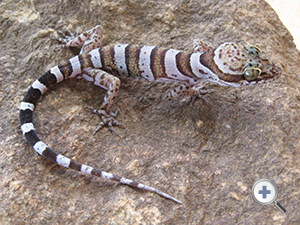 This work involved accessing many remote localities and many hours of spotlighting at night to find these geckos by their distinctive eye-shines. The taxonomic component of this project is now complete and has resulted in a revision of Australian Ring-tailed Geckos which include five species, four of which are new. The pre-existing name, C. tuberculatus, applies to the populations found in the Cooktown area and extending north to Cape Melville. This was first proposed by Lucas and Frost in 1900 but largely overlooked because it was assigned to Hoplodactylus, a genus that doesn’t occur in Australia. Couper, P.J. & Hoskin C.J. 2008. Litho-refugia: the importance of rock landscapes for the long-term persistence of Australian rainforest fauna (5048 KB) . Australian Zoologist 34(4):554-560. Couper, P.J., Amey, A.P. & Shea, G.M 2004. Comments on the taxonomic status of Cyrtodactylus abrae (1369 KB) . Memoirs of the Queensland Museum. 49 (2): 648.